Good morning! We’ve made it to the weekend! It is the time of year when I whip out the calendar and the brochures of my race sponsors and series and start dreaming and scheming for the upcoming year! 2014 is going to be an AMAZING year of races. There are a host of reasons why I have chosen them but in my opinion, they are the three best in Canada and I am so excited to be a part of them. So what does my 2014 look like? March 1 – Colour Me Rad – Tampa, FL. This is the race that my family and I are tackling together. April 26 – Endurrace – Run Waterloo. 8 KM. May 12 – Baden Road Race – 7 Miler. I did this race before. A super fun, local run. May 24 – Sulphur Springs Ultra – 50 KM. Looking forward to breaking into my first ultra of the season in beautiful Ancaster, ON. June 15 – Waterloo 10 KM Classic – Run Waterloo. Part of the Battle of Waterloo Series. June 21 – 5 Peaks Heart Lake 12 K – 5 Peaks Series. July 6 – Dirty Dash – Run Waterloo – 8 KM mud run. ‘Nuff said. Let’s get dirty, friends! July 12 – 5 Peaks Rattle Snake 12 K – I love climbing here in the summer and I can imagine I will adore running it! Aug 9 – 5 Peaks Albion Hills – I am only doing the 6 KM in this because post-race, I am grabbing my bags and headed on the biggest race of the season! Aug 12-17 – Transrockies 120 Miler – This is a 6 day trek that I am doing with another CLIPPED athlete. I am going to be logging some huge miles this summer to prepare and I cannot wait! Sept 6 – Kortrights 5 Peaks 12K – Back in the racing saddle after taking some time off. Sept 13 – Harvest 1/2 Marathon – Run Waterloo – This is the newest race in the series and I am so excited to rock the back country roads with this half. Sept 20 – Hardwood Hills 5 Peaks – Grand Finale of the series. I cannot wait – it’s going to be a PARTY! Oct 11– Rim2Rim2Rim in Arizona – That’s right! Back to Arizona I go! I am teaming up with some fabulous athletes from Michigan to conquer the Canyon. I even get to meet the multitalented Solana from 5 Peaks BC while I am out there! Oct 19 – Scotiabank Waterfront Marathon – Canada Running Series – Going back to conquer the race this year. I am hoping for a sub 3:20 this year. Dec 18 – The Santa Pursuit – Run Waterloo – 5 KM dressed as Santa? Yes please! 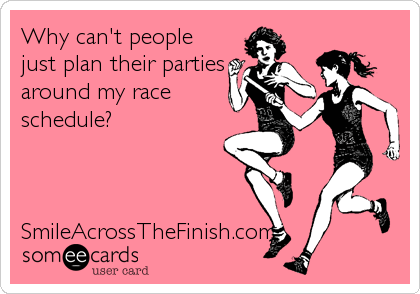 I would be beyond thrilled for you to join me on any or all of these races! I will be sharing reviews of the races as I do them. One thing I am looking forward to in the 5 Peaks series is the camping with friends that is involved. My sponsor and a group of friends are headed up overnight the evening before the races and camping out. Let me know if you are running them – you are more than welcome to join us! Sounds amazing! you have inspired me to sign up for the 5Peaks series – have done one before at Hardwood Hills and loved it. Thanks! Any training suggestions?